... was (were) had in the LoneStar Antiques Mall tea room Saturday. Oh, and I found the LISTEN TO LAUGHTER (videos and audio of people laughing) website. It's pretty entertaining.... and healthy, according to lots of people. 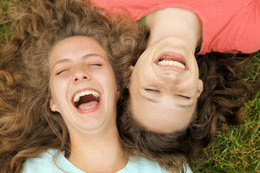 Laughter's healing effect was written about in ANATOMY OF AN ILLNESS by Norman Cousins. In my Google search of 'laughter as medicine' I found many good articles. One of them is "Laughter is the Best Medicine" in HELPGUIDE.org. 'Course you may not feel like laughing. Well, sometimes life gives us days that are not for laughing, but for crying. And believe-you-me, I'm all for crying when you need do. But I love to laugh. "... the cheerful heart has a continual feast." The Christian is a (person) of joy...A gloomy Christian is a contradiction of terms, and nothing in all religious history has done Christianity more harm than its connection with black clothes and long faces. Those parties look like fun!